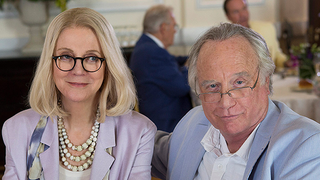 ABC has released the first publicity photo for their upcoming miniseries Madoff, which stars Richard Dreyfuss and Blythe Danner as Bernie and Ruth. They look good, right? Nice clothes. Good hair. Believable smiles. But it sort of just looks like a photo of Blythe Danner and Richard Dreyfuss having a formal lunch as Blythe Danner and Richard Dreyfuss, right? Images via ABC / Screengrab.